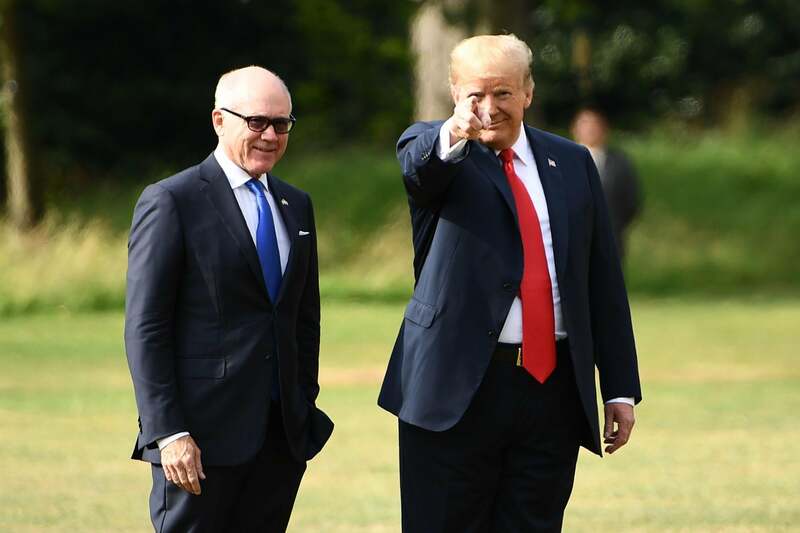 The United States’ ambassador in London has urged Britain to back Donald Trump in putting pressure on Iran and rethink its support for the “flawed” 2015 nuclear deal. It comes after the UK and its European allies reacted with dismay when the US President decided to pull out of the landmark deal earlier this year which relieved sanctions on Iran in return to an end to Tehran’s military nuclear ambitions. The Joint Comprehensive Plan of Action (JCPOA) – referred to as the Iran nuclear deal – was signed three years ago by the former US President Barack Obama, alongside the UK, Russia, France, Germany, China and the EU. Last week Jeremy Hunt, the foreign secretary, joined with his European counterparts and agreed to work to block the impact of Mr Trump’s new sanctions against Tehran, which were reimposed on Monday. Foreign office minister Alistair Burt said the United States had “not got this right”, adding: “Sometimes you need to take a stand against friends”. But in an article for the Sunday Telegraph, the American ambassador to the UK, Woody Johnson, urged ministers to rethink their position. “It’s time to move on from the flawed 2015 deal,” he said. "We are asking global Britain to use its considerable diplomatic power and influence and join us as we lead a concerted global effort towards a genuinely comprehensive agreement,” he said. The ambassador said Iran had used the flow of money coming into the country since the easing of sanctions not to improve the lives of ordinary Iranians but to beef up spending on the military and networks of proxy forces and terrorists. "It is clear that the danger from Iran did not diminish in the wake of the deal," he said. "It grew. "Far from becoming a more responsible member of the international community, as we had all hoped, Iran grew bolder." Police officers stand guard at the scene of a shooting at Claremont Road in the Moss Side neighborhood of Manchester, Ten people were taken to hospital on August 12, 2018 after shots were fired in Manchester in northern England, police said. Local people protest outside the Hillingdon Conservative Association office on August 9, 2018 in Uxbridge, England. Today's protest is being held following comments made by former Foreign Secretary, Boris Johnson, against the wearing of Burkas by Muslim women in the United Kingdom. An independent panel will investigate complaints made regarding Mr Johnson's comments and possible breaches of the Conservative Party code of conduct. The scene on the A96 between Huntly and Keith in Moray where a five people have died and five more were injured after a crash between a minibus and a car. Great Britain's Geraint Thomas cleans his eyes after tear gas was thrown at the pelaton during a farmers' protest who attempted to block the stage's route, during the 16th stage of the Tour de France, between Carcassonne and Bagneres-de-Luchon. The race was halted for several minutes. Britain's newly appointed chief Brexit negotiator Dominic Raab, left, and EU's chief Brexit negotiator Michel Barnier speak to the media ahead of a meeting at the European Commission in Brussels. Britain's chief Brexit negotiator David Davis resigned less than two weeks ago and his successor Raab met his EU counterpart Michel Barnier for the first time late Thursday. Pro-EU demonstrators wave flags outside the Houses of Parliament in Westminster. Planes land at Heathrow airport ahead of the vote in parliament which decided Heathrow airport should have a third runway. He called for a "united front" among Western nations to force Tehran into a change of course. "Only by presenting a united front can we exert the maximum possible pressure on the Iranian regime, and get it to finally change course and put an end to its malign and reckless activities both at home and abroad," said Mr Johnson. "If the regime does make tangible and sustained changes to behave like a normal country, America is prepared to resume full commercial and diplomatic relations. Iran will be free to develop advanced technologies and play a full role in the global economy. "Until then, America is turning up the pressure and we want the UK by our side."